GET CLOSE TO NATURE at Perché dans le Perche, a lovely little home within the branches of a centuries-old sweet chestnut tree in South Normandy, France. Courtesy of Sawday’s Canopy & Stars and Brittany Ferries, you could be enjoying life in the trees – taking in beautiful views over the Perch Natural Park and spotting birds flying over 25 acres of wildlife heaven. The cosy, comfortable treehouse features a master bedroom, living room, kitchen, shower room and downstairs bedroom. There’s electric heating and lighting, hot water, a large shower and two terraces that are perfect for al fresco dining. 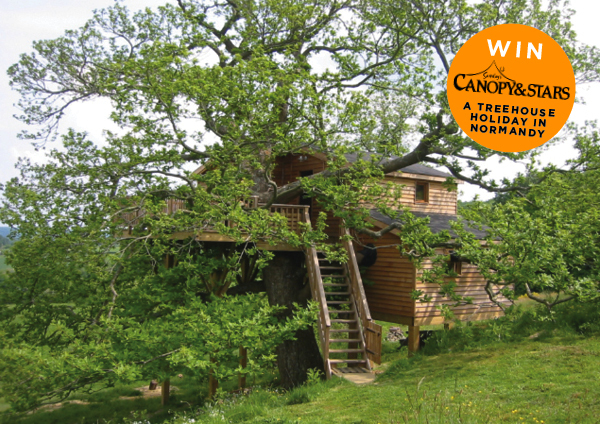 To find out more about Sawday's Canopy & Stars holidays, call 01275 395 447 or visit www.canopyandstars.co.uk. Sailing from the ports of Portsmouth, Poole and Plymouth, Brittany Ferries take you direct to Brittany and Normandy. To book a crossing call 0871 244 1400 or visit www.brittanyferries.com. HOW TO ENTER Click here to enter now before 31st October 2013! It's your chance to win a four-night holiday for four people to Perché dans le Perche in Normandy plus a return crossing for a car and up to four passengers, with a cabin, on any Brittany Ferries route to France from Portsmouth, Poole or Plymouth. The stay and crossings must be taken before 30th September 2014 (excluding July, August, and all school and public holidays in the UK and France) and are subject to availability. The prize cannot be claimed against any existing bookings. Car hire, additional travel or accommodation costs and travel insurance are not included.